About Axel R. Message Axel R.
We highly recommend Axel as a local guide to Granada. He is personable, charming, and well informed about both local history and the attractions of the area. He went out of his way to accommodate and entertain us. TOUR GUIDE RESPONSE: Thanks so much for your nice comment and our pleasant visit. I hope you enjoy the Flamenco show as well. 5 stars out of 5. Axel was great, I'd use him again and wholeheartedly recommend him to others. TOUR GUIDE RESPONSE: Thank you for your nice review and the lovely day we had together. Have a good trip home. Axel was very patient with our 5 person group and modified the trek based on our stamina level. He was a very interesting person to talk to and tried to get to know us in order to enrich our experience. He was very knowledgeable about the area around Granada as well as general curiosities we had about Spain. Thank you Axel for a great activity, it was enjoyed by our family! TOUR GUIDE RESPONSE: Dear Ferreira family, thank you so much for your friendly comment and also for the enjoyable time we spent together in the mountains. Good luck for all of you ! Axel was great, very nice and knowledgeable. We enjoyed very much the tour. We came away from our 3 hour tour with a brief history on Granada and interesting tour. I would like to give a 5 to our guide, Axel for our tour of Granada, Spain on Sept 13th. He was very knowledgeable and provided an interesting tour of the city. We had a wonderful overview walking tour of Granada with Axel. He's very knowledgeable, speaks perfect English, was flexible about the starting time, is pleasant easy company and tells about the local history, sights, restaurants, etc. We started out at our hotel, walked up through the old Roma section of the city, and then down through the Centro. We'd highly recommend him! Axel was great. Took us on a perfect hike in the Sierra Nevada followed by lunch by the river. Well informed and interesting company. Couldn't thank him or recommend him enough. Really pleased to find axel he added an extra dimension to our weekend in granada. I used to live in Sevilla and never had the opportunity to visit the famed city of Granada until our most recent vacation to the Tierra de la Roja. 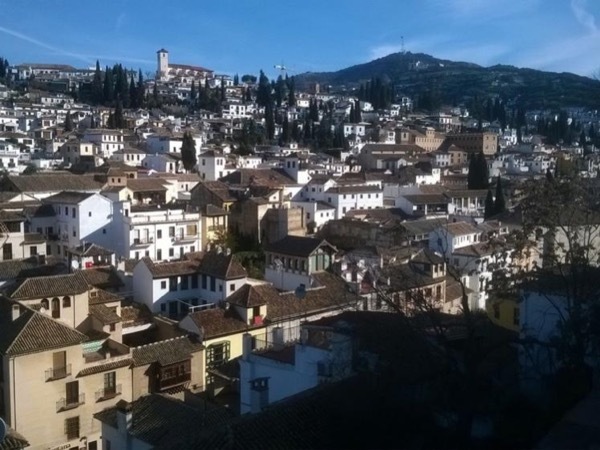 While Granada is known for its tapas and nightlife, it mainly known for its flamenco. Thus, we enlisted Axel to bring us to the Albayzin, which is the ancient gipsy barrio of Greater Granada and flameco capital. This area is BEAUTIFUL. Axel did an amazing job and was sure to make sure we were located in the front row for the show. We HIGHLY recommend Axel! TOUR GUIDE RESPONSE: Dear Tucker family. Thank you for your kind comment and your pleasant company. The 4 of us had a great day hiking in the Alpujarras with Axel & Carlos. Axel had gone to a lot of trouble to suggest a range of tours and he came up with one which was just right for us. The transport arrangements worked well and the tour gave us the opportunity to experience the countryside & villages outside Granada where we were staying. The route was very varied and challenged us just enough! Axel & Carlos were good company and we had a lot of fun with them. The booking system worked well too. Axel was an excellent tour guide. We contacted Tours by Locals to find a person who would give us a tour and take our younger son to the Grenada airport to fly back to the US early. Axel not only took our son to the airport, he went inside to make sure he got on the correct flight. We saw the Alhambra and gypsy community. Axel knew the people and we enjoyed appetizers and drinks. He made sure to get us back to the ship and was waiting by the ship in the morning with snacks and drinks. Highly recommend! TOUR GUIDE RESPONSE: Hi Shutty family ! I didn't see the friendly comment until now. Thanks so much and thank you for sharing your time in Spain along with your lovely family with me. Be happy ! It was an amazing experience for me. The hiking was great at the end you feel how much you achieve both of the guides was an amazing gave me the encrogiment to achieve the goal. With a rich information about the area. I wish to do it again with them. Thanks alot. TOUR GUIDE RESPONSE: Thank you Mohamed, we enjoyed the tour with you. Go on being happy and see you next time.